The George Maurer Jazz Group will complete their holiday tour of the state with a concert at the auditorium at Paynesville Area High School on Saturday, Dec. 21, at 7 p.m. The George Maurer Group Swinging Holiday Jazz Concert features jazz holiday music from their group's new CD release, Jazz Nog, recorded live in concert last year at the Paramount Theater in St Cloud and the legendary Dakota Bar and Grill in St. Paul. Featured performers on the program include Ann Michels on vocals, Jeff Engholm on bass and vocals, Muggsy Lauer on guitar and vocals, Dave Stanoch on drums, Richard Witteman on trumpet and vocals, Tom Pattock on trumpet, and Maurer at the piano. The George Maurer Jazz Group, based in St. 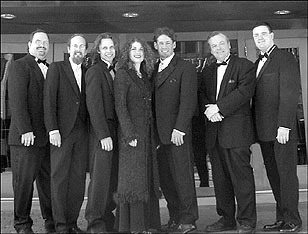 Cloud, will perform a holiday jazz concert in the Paynesville Area High School Auditorium on Saturday, Dec. 21, at 7 p.m.
Jazz Nog captures the spontaneity of a live George Maurer Group performance, with the sounds of a live jazz club in action and the usual group banter that is a staple of their performances. The group took their hand at arranging traditional Christmas songs in a George Maurer Group "not-so-traditional" way, as witnessed by their rendition of Tchaikovsky's Dance of the Sugar Plum Fairy, which lifts a riff from a Tom and Jerry cartoon as its base line and sounds more like a Mancini big band chart than something to be danced to in a pink tutu. Tickets for the 90-minute concert are $12 in advance for adults and $15 at the door. For students and seniors, tickets cost $10 in advance and $12 at the door. In Paynesville, tickets are available at the Central Minnesota Federal Credit Union.